Biting Back NYC Event, December 1st, 2nd, 3rd. For those of you who aren’t aware of the piece, it demonstrates actual animal cruelty, and the Guggenheim considers it “art.” Although the piece was removed from the exhibit after massive petitions, traditional protesting, and an outpouring of people expressing general disgust via social media, the Guggenheim claims to only have pulled the piece for their own safety, not due to any other ethical reason. Our goal with Biting Back is to express our own social message— one that displays only the love for animals NOT cruelty. 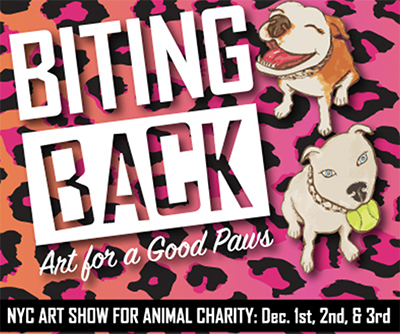 Let’s spin this into a positive message, and raise money for animal charity with art! We, Gemma Rose Project, are 100% standing behind Eliza Kapitan and Kim Holiner who have organized this event. The Guggenheim museum handled this in extremely poor taste, and never even accepted responsibility or accountability for their actions. We’re hoping this gets the proper attention it deserves and that it makes Guggenheim think twice before taking similar actions in the future. Gemma Rose Project can now be found on Dogly.com!